Students embrace real life animal encounters with intern Brandi Brumbaugh to spark curiosity. 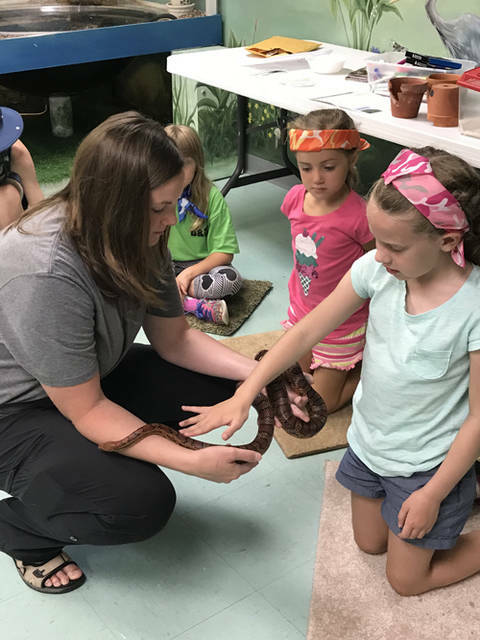 DARKE COUNTY – Darke County Parks invites educators to attend a free program geared toward hands-on, investigative learning at 10 a.m. Sept. 8. Inquiry is a fundamental tool used to trigger a student’s curiosity along with building confidence, encouraging independent behavior and strengthening their ability to handle complex problems. This technique can create excitement in the classroom as students take a hands-on approach to learning. Facilitator Kathi McQueen is a naturalist for the park and obtained her graduate degree through Miami University’s Project Dragonfly, which utilizes inquiry and participatory education approaches to enhance learning. This program will be held at the Shawnee Prairie Preserve Nature Center and registration is required. Individuals can call 937-548-0165 to register or with additional questions.